Improvement in one’s golfing game demands repetition as well as adequate guidance in one form or another. Yes, we wish there was some magical gadget on the market that could lower your golfing handicap overnight. The best we can do however is recommend the closest thing to it. And that is a fitness watch. The advancement of technology, never ceasing to amaze us, has in recent years seen the emergence of a nifty little gadget known as a fitness watch. Targeted at sports men and women around the globe, a fitness watch is designed to improve the overall experience of attending a workout or sporting event. With usage across almost every sport, fitness watches contain a variety of functions and features to make your sporting day as convenient & strategic as possible. Some of these features include goal setting, step counting, monitoring of heart rate, maps and trackers for sporting venues around the world & even calorie counters just to name a few. You may be under the impression golf is not typically the type of sport that would benefit from these functions however professional golfers would strongly disagree. The fitness watch has comfortably slid into the golfing world as an essential tool for convenience and gradual improvement in one’s game. When used specifically for golfing a fitness watch will isolate the functions most useful to the golfer in question. Essentially your “smart” watch will personalize its settings and content to suit your exact goals for your game. 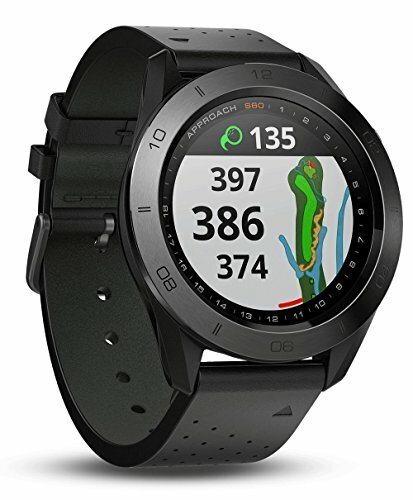 One of the most useful features of a fitness watch in golfing is its GPS ability to track and load over 40,000 (depending on the brand) golf courses & their respective holes right onto your wrist. It will provide accurate statistics, trajectories and weather conditions applicable to the specific hole the golfer faces. It will also keep score of your game. Fitness watches are recommended for golfers because of their slim, lightweight and comfortable design. These characteristics prevent them from interfering with one’s swing the way bulkier, heavier day-to-day watches would. Wearing your fancy Rolex on the course may seem appealing at first until you consider the amount of torque being generated with every shot. You not only risk damaging the watch but also your wrist. Because of the endless list of recognized sports, the fitness watch industry has catered to the needs of us all. Whether you’re a swimmer, runner or you enjoy the occasional ski session there’s a watch just right for you. You have the option of purchasing a watch solely for the use of golf. Or instead you can purchase an all inclusive, MultiSport fitness watch with all the bells and whistles. Is golf your only active activity? Do you frequent another sport as well as golf? Do you plan on sharing the watch with another family member or friend? Explore the options and decide which seems most accommodating to your life (and budget). Don’t look at a fitness watch as just another toy you’re going to have to lug around the golf course. Rather, this is a compact, one stop shop for all the individual gadgets you’d usually be carrying around. These watches have the added function of transmitting notifications when your cellphone is receives a text or call. This means you can leave your phone packed in your golf bag all day instead of carrying it on your person the entire time “just in case”. Not only does this remove the risk of distraction during a shot, but it also means one less mechanical device to keep track of while on the course. The watches offer a range of battery life spans to suit your personal needs. Some watches will last up to five days on full charge and others up 3 months. It eliminates the need for you to remember to charge it before each golfing weekend. If your biggest worry is that you will no longer have access to your trusty Hole19 app if you are no longer carrying your SmartPhone around - fear not. A simple download puts the app right onto your wrist inside the golfing watch. We know - they’ve thought of everything. Because of the nature of fitness watches and the broad spectrum in which they can fall in terms of sport and functions, choosing the right watch will come down to your personal needs and your budget. Let’s take a look at our shortlisted options that are now available to you. This stylish little device is the pride and joy of well-known brand Garmin. This unit was designed with functionality both on and off the course in mind. While it is a MultiSport device, its focus and functionality around golfing is its claim to fame. It features a tempered glass protected HD screen and stainless-steel body in black finish that make pairing it with any outfit quite simple. Its screen is also 20% bigger than previous units by Garmin. When in golf mode, it will last up to 10 hours fully charged. When in regular watch mode it will last up to 10 days. 10 hours is typically the standard range of time for a fitness watch life when active on the green. It is linked to over 40 000 golf courses worldwide and Garmin offers free, regular updates on this data to ensure your device is always accurate when in use. On top of this, the latest Garmin Golf App as well as a range of other apps including Uber are preloaded onto the device and ready to go. This watch focuses around a bright, communicative screen that constantly provides statistics and feedback based upon data it collects from you throughout your day. 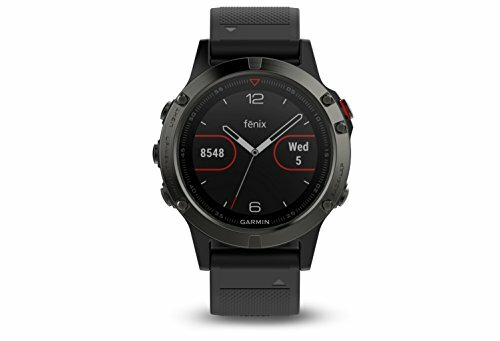 The Garmin Fenix is scratch and water resistant as well as WiFi & Bluetooth enabled. It comes in a range of colors, so you can find one to suit your personal taste, anywhere from the usual gold and silver to electric green. The battery will last up to 16 hours when in active GPS mode, and up to 14 days when in regular watch mode. This is significantly longer than its brother the Garmin Approach. Unlike the Approach, however, the Fenix 5 doesn’t feature a touchscreen. This may be the deciding factor depending on your personal preference. Though it is also on the pricier side of the fitness watch range, it does offer enough functions and features across a variety of sports to justify its price tag. The constant data feedback makes it the kind of watch that will likely motivate you to add to your active routine. A morning jog or evening swim in addition to your weekly golf doesn’t sound too far fetched when this gadget calculates and inspires your every move. 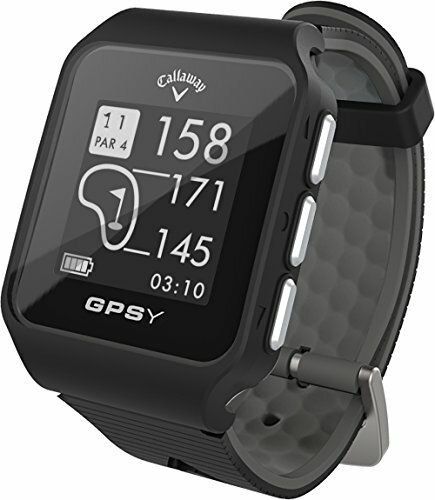 Coming in at almost a third of the price of its competitors, this device is an affordable and solely golf focused watch. It’s perfect for the weekend golfer who doesn’t have time in the week for anything else. It is preloaded with information on over 30,000 courses and because it only focuses on golfing the feedback and processing of the unit are extremely fast. Your distances, speeds, weather conditions, and odometer readings are quickly relayed back to you. The battery lasts a good 10 hours at full charge (while using GPS) — the perfect amount of time for a day on the green. When GPS is not in use the watch will stay on for up to 90 days. This watch communicates solely with satellite signals and will never need to be wound or updated by you. Simply charge it up, strap it on and head out. Choosing a watch is somewhat like making a new friend. As with a friend your intention is to like it, have it around you quite often, and enjoy communicating with it. Above all, you need to trust it. Since the benefits and convenience of fitness watches has already been proven in the sporting world, it is simply up to you to choose the right one to fit into your own world. So, the real question is - just how seriously do you take your golf?